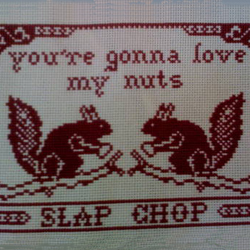 Like we always say at Craftster, “You’re gonna love our nuts”. Because we have tons of nuts here: nut projects, nut recipes, and even some nutty moderators and members at large. This makes this Slap Chop! cross stitch project near and dear to our hearts. Not familiar with the iconic Slap Chop? Click here to see what all the fuss is about. You’re gonna love my nuts.